(And speaking of which) the ever popular, city of Las Vegas. But what you may not know is that Nevada offers extensive financial aid opportunities available to Nevada residents who plan to go to college..
From career-based scholarships to need-based scholarships, Nevada is committed to making college affordable for students. Plus, there are even more financial aid opportunities beyond state funding. Let’s take a look at some of ways that you can start researching how to pay for college. When first researching funding, look no further than the FAFSA. The FAFSA, which stands for the Free Application for Federal Student Aid, can be the ultimate start to paying for your education. From direct tuition aid to automatically applying you for certain scholarships you might be eligible for, the FAFSA is a fantastic resource. However, even though the financial aid opportunities are amazing, the form itself is not. Many students find it difficult to complete because it is lengthy and confusing. That’s why we created a step-by-step guide to completing the FAFSA questions to help you get through the form more easily. Once you’ve filled out the FAFSA, you should look into state financial aid resources. And luckily for you, as a student in Nevada, you have many opportunities to receive funding. Right off the bat, you can check out the state of Nevada’s list of scholarships and grants, which are listed by subject in this helpful brochure. While it is amazing how many available opportunities there are, it can also be difficult to know where to begin. That’s why we’ve listed some of the major scholarships available to Nevada students. TEACH Early Childhood Nevada provides scholarships of up to 80% of in-state tuition to study early childhood education and work in the field after graduation. Nevada Women’s Fund Scholarship awards an annual scholarship to a female resident of northern Nevada who plans to attend specific northern Nevada institutions. Otto Huth Scholarship provides financial aid to students who are or were in the custody of the Nevada Division of Child and Family Services or of a foster family. Community Foundation of Western Nevada Scholarships are offered to many Nevada students of different backgrounds and financial situations. To reduce out-of-pocket tuition costs, you should apply to as many scholarships and grants as you can. Remember, scholarships and grants do not need to be repaid, so don’t leave that “free money” on the table! If you’re a high school student, don’t overlook one of your most-important sources of scholarship info: your guidance counselor. Schedule regular appointments to see if any new opportunities have become available. You can also search for scholarships online through any number of search engines, such as CollegeScholarships.com (which lists 41 scholarships for NV residents). Try searching by major, extra-curricular activities, nationality, or any other characteristic that sets you apart. Another great opportunity to receive funding is through the school that you are admitted to. Most schools have extensive financial aid opportunities and can help you. For example, the College of Southern Nevada provides students with many resources, such as work-study financial aid, to help bridge the gap between your tuition costs and your savings. There are also academic scholarships available based on categories such as subject area or background. For example, the Barry M. Goldwater Scholarships gives financial aid to selected students studying STEM subjects. Additionally, students who are looking to transfer from a community college to the College of Southern Nevada may be eligible for the Jack Kent Cooke scholarship. The University of Nevada, Reno (UNR) is committed to admitting passionate and smart students. That’s why they offer the Presidential Scholarship of $8,000 per year to high-achieving students. UNR also awards the Nevada Scholars Level Scholarship as well as the Pack Pride Level Scholarships, both of which are merit-based scholarships for students who are not necessarily at the top of their class. UNR additionally provides grants to students in financial need. There are many other colleges and higher education institutions in Nevada that offer financial aid, so be sure to check out the financial aid web pages of any and all that you apply to. 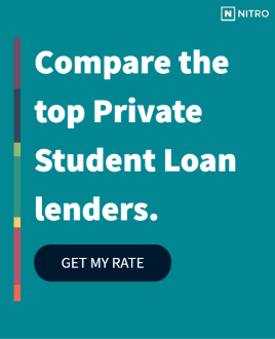 If you’re still unsure how to pay for the rest of your tuition, it might be time to consider a private student loan. Taking out a loan is a serious financial decision. That’s why we’ve found the best banks for private student loans to help ensure you’re getting the best deal possible. It is also essential that you can plan for your finances before, throughout, and after college. We created NitroScore to help you forecast how your college loan payments will fit into your post-college finances. Our NitroScore tool will take into consideration your school, major, savings and scholarships, as well as your loans. Now that you have these tools, financing your education is within your reach!